ShareI just have one question. 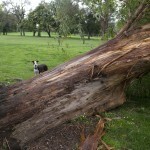 Was it the wind or the water that toppled this eucalyptus tree? Can imagine growing this large and falling one stormy day. All that work growing up only to come down.